TOFT Timogen added to his successful Championship win at the BAS Nationals with a Champion ribbon today at the British Alpaca Futurity 2015. 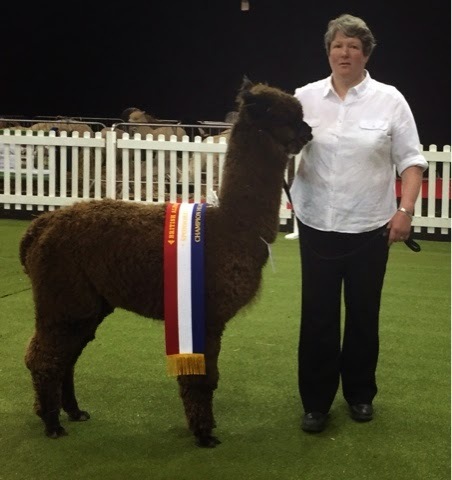 TOFT Timogen is a son of Lavender Park Tulley who beat off seriously stiff competition this afternoon to take the Brown Male Champion Huacaya in the show ring to add to his Champion Brown Huacaya ribbon in the British Alpaca Futurity fleece show. This young Tulley boy is not yet two and he is gathering a lot of momentum and if I could get Linda our herds woman to smile at the same time he presents to the camera life would be Perfick! That's better Linda...what a lovely smile. What about us? Don't we get to go to the Ricoh? Salmon fishing in the Yemen? What's with the Van, man?